Eventus is an award winning Enterprise Workflow and Workforce Management System designed to dramatically increase the work efficiency of companies. Due to its core functions, features and architecture, Eventus has the added advantage that it can also play a significant role in the integration of enterprise applications. have to be managed – executed, controlled, measured, automated and of course optimized both partially, or end-to-end. 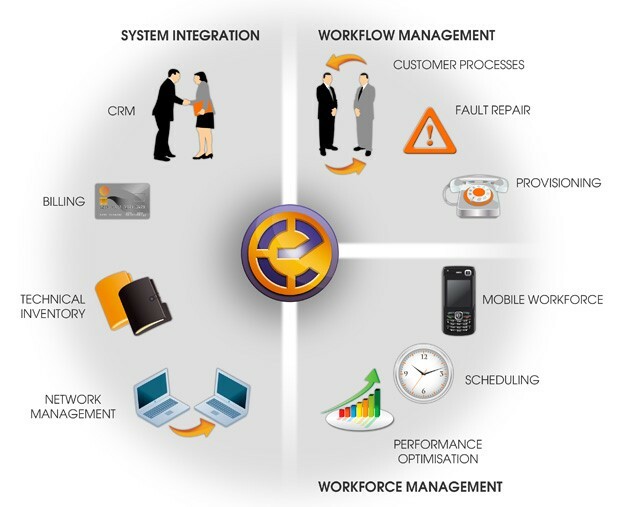 Considering the functional areas, Eventus can be used for in workflow and workforce management, there are no boundaries. This is due to the fact that Eventus itself is a framework with all necessary features a business process might require from a Workflow and Workforce Management System. These features include escalation mechanisms, sophisticated priority handling, modern human communication channels (like web based GUIs, e-mails, sms notifications), automated dispatching, SLA handling, map/GPS/GIS integration, smartphone clients, multilingual support, bulk task execution, shift handlings, calendar handlings, and of course limitless integration capabilities with internal or external IT Systems. Eventus, with all its features has the capability to face the business and technical requirements that a modern, IT supported company might raise. In terms of performance, reliability, ROI, TCO, the surrounding services like SLA based support, or consultancy, the limitless possibilities of integration, lowest level data mining and reporting possibilities Eventus enables businesses to run at their peak performance, and to monitor their activities. Eventus is a high availability, highly reliable and scalable system, specially designed for use in critical business situations and optimized for a large number of users and customers. Eventus has numerous built-in capabilities to make it an absolutely reliable solution, even in more complex environments: distributed architecture, data replication (either server by server or by recollection), ‘global server’ feature, fail-safe solutions, etc. As a part of the company IT infrastructure, reliability is based on lower level components such as the hardware, OS, RDBMS – Eventus supports the most reliable platforms, like Unix and Oracle. Eventus is one of the top reliable applications among all the existing Eventus users. Implementing Eventus has numerous advantages. Firstly, it has a professional closed-loop framework for company workflows and resources. The real increase in efficiency, however, comes from the fact that the maximum numbers of actions are automated: manual tasks are algorithmic, and there is even controlled support for exception handling. Eventus guarantees that anything for which a rule can be constructed in a human or machine language will be executed according to that rule. A key advantage of Eventus is that it improves the efficiency of employees as well as that of the technology. With its ergonomically designed and tested user interface, functions that adjust to both different user roles and experience levels, and accessibility through the Web, Eventus ensures that users can be trained quickly and simply, and that thereafter they can focus on the task at hand at all times. The Palmtop module, the SMS functionality, the ergonomically designed code systems and search fields, and the menu system specially designed for Eventus: these features are all aimed at providing a system that everybody can use in the most efficient way for them.